This Young Economist: "... but thinking makes it so." "... but thinking makes it so." Last week, on my parents' first trip to visit us in Colorado, my parents brought a car full of my old stuff that I have done without for the last 5+ years: Trophies, certificates of achievement, pictures from camp, books that I bought and never read, my baseball card collection, etc. With the CU-Boulder campus closed today, this was a good day to start going through that stuff. It is an interesting walk down memory lane. 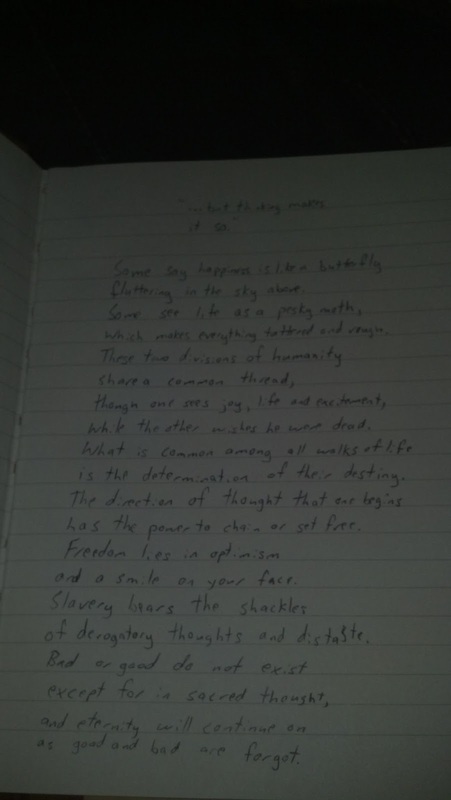 In the midst of the trophies and memorabilia, I found a journal that was empty except for one page, and on that page, there was a handwritten poem that I had written when I was in high school. 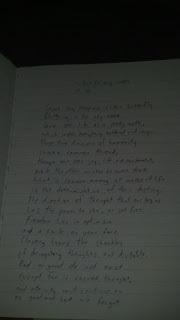 In case you're interested in what Teenage Tony had to say, here is a picture and the text from that poem. fluttering in the sky above. which makes everything tattered and rough. while the other wishes he were dead. is the determination of their destiny. has the power to chain or set free. of derogatory thoughts and distaste. as good and bad are forgot.